I have a few travel bags I like to use, and one of them is a backpack (it's the one at right - I like it because it has a laptop sleeve and an iPad slot). The problem is, when I first started using it, I'd put my folders into my backpack, where they only fit in sideways and all my stuff would fall out and get all mixed up in the bottom of the bag. A long time ago, I saw some backpack-friendly backpack folders, but I haven't been able to find them in the recent past. So, I decided to make my own. I experimented with several approaches and thought I'd share what I learned with you. Folder jackets: These are essentially sleeves that you put your folders in or use as standalone pockets. They are slightly larger than normal folders, and only open on one side. They worked OK, but I found I had to remove them from my backpack any time I wanted to put something in, or take something out. I still use one of them for supplies (post-it notes, notecards, stamps, extra business cards, envelopes, pen refills, etc.) and it works fine for that purpose, as I don't have to get at those items very often. Paper folders: These work OK, but don't last very long. The seams give way much too soon for my tastes. Plastic folders: These are excellent. The best I've found are the GTD folders from David Allen Company - they are heavy duty plastic and I've been using the same set for about 4 years now. I tried other, lighter weight plastic folders from office supply stores but they weren't tough enough. The David Allen folders are color-coded, very sturdy, and come in both A4 and US Letter sizes. Once you have your folders, you need to "plug up" one side of them so they contain your papers, cards, etc. when they are put in your backpack sideways. To do this, you simply close up one side with tape. My first attempt was on my Inbox folder (at right) and I used duct tape - at the time, all I had was teal-colored tape. This worked fine, but I have found that the duct tape tends to peel sometimes or stick to other things. For the rest of my folders I used heavy-duty, clear packing tape, which is now my favorite. This is the thicker variety of tape that feels more vinyl-like than plastic. It lays down flat, and is very strong. Cosmetically, the clear tape is more appealing - as you can see in the picture of my Receipts folder, below - the clear tape is on the right, and you can barely see it. When you apply the tape, keep the edges of the folder together pretty tightly - if you leave a gap, you'll expose some adhesive and it will stick to your papers and attract dirt & paper dust. 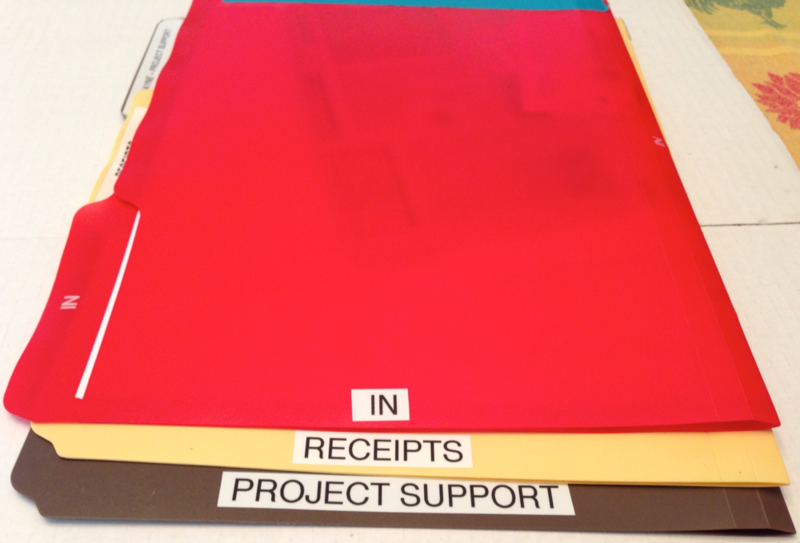 The final step is to add labels so you can tell which folder is which while they are safely tucked into your backpack. I used my label maker to create small folder names (the names match the names on the "normal" folder tabs on the long edge. I put them so I can read them while they are in my backpack and simply slip items into the proper folder without removing them - this is particularly handy for my Receipts folder and my Inbox folders. See below for an example of how easy it is to read them from the end when you use this approach. So, there you have it - easy, do-it-yourself folders for your backpack. 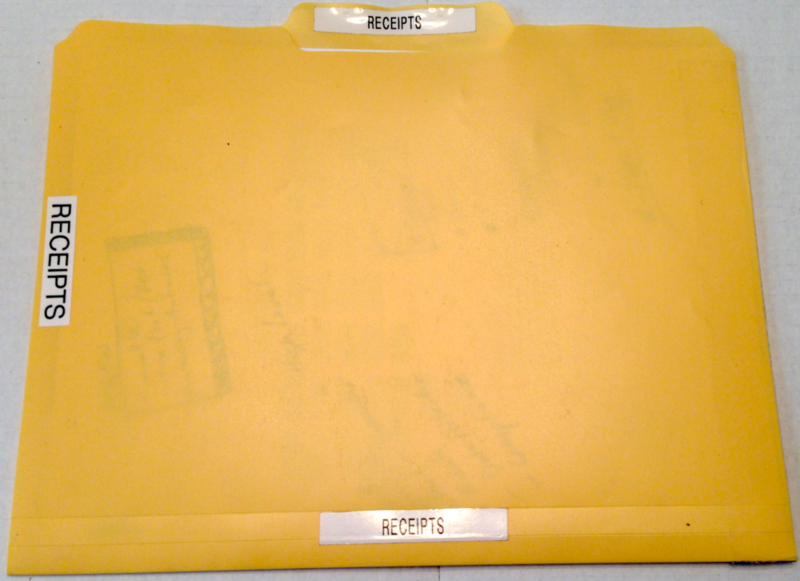 By the way, when I use my "normal" briefcase, I use these exact same folders. They work just fine with one side taped up.